1066 huscarl, Battle of Hastings ‘The Anglo-Saxon warrior at Hastings is perhaps not so very different from the British “Tommy” in the trenches,’ photographer Thom Atkinson says. 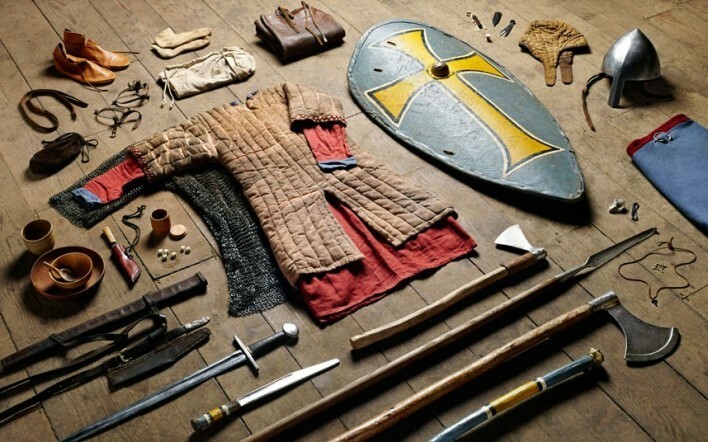 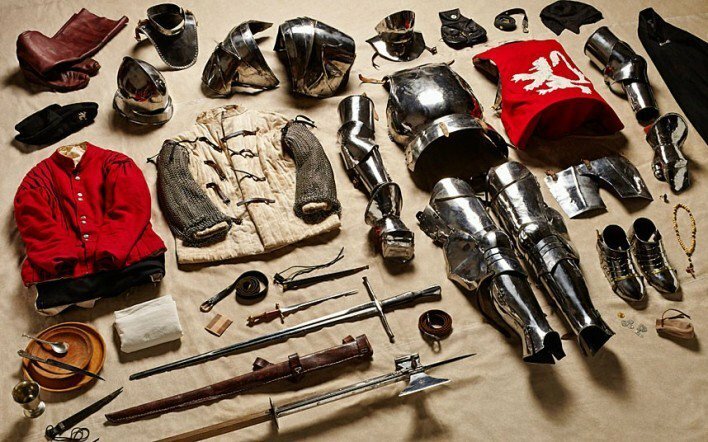 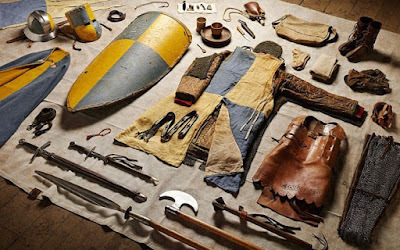 At the Battle of Hastings, soldiers' choice of weaponary was extensive. 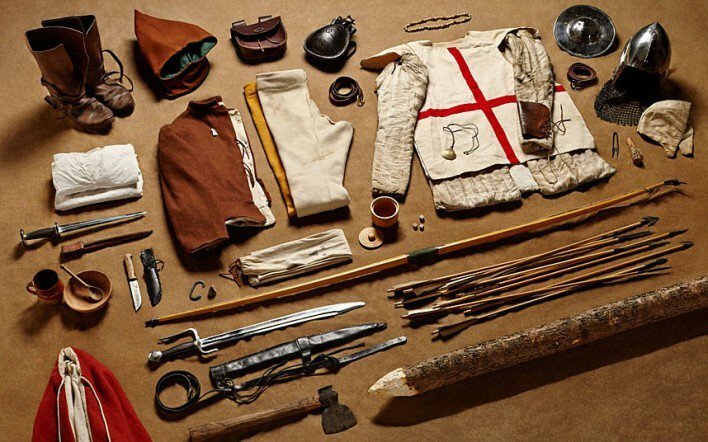 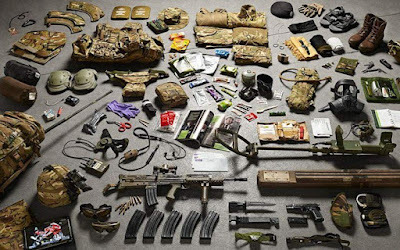 1415 fighting archer, Battle of Agincourt Having worked on projects with the Wellcome Trust and the Natural History Museum, photographer Thom Atkinson has turned his focus to what he describes as ‘the mythology surrounding Britain’s relationship with war’. 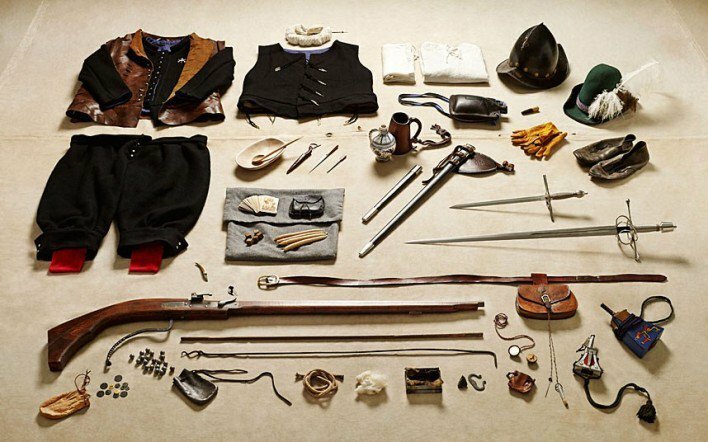 1588 trainband caliverman, Tilbury The similarities between the kits are as startling as the differences. 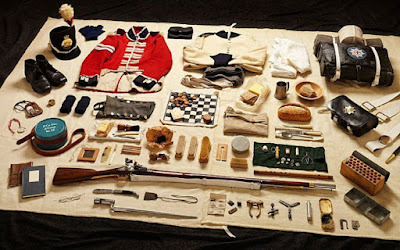 Notepads become iPads, 18th-century bowls mirror modern mess tins; games such as chess or cards appear regularly. 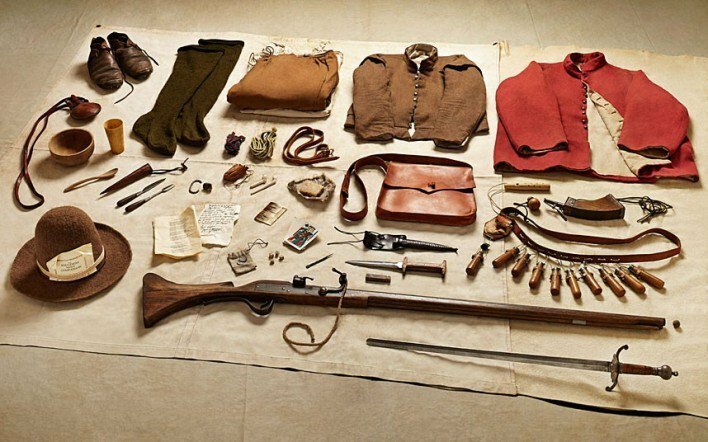 1645 New Model Army musketeer, Battle of Naseby Each kit represents the personal equipment carried by a notional common British soldier at a landmark battle over the past millennium. It is a sequence punctuated by Bosworth, Naseby, Waterloo, the Somme, Arnhem and the Falklands – bookended by the Battle of Hastings and Helmand Province. 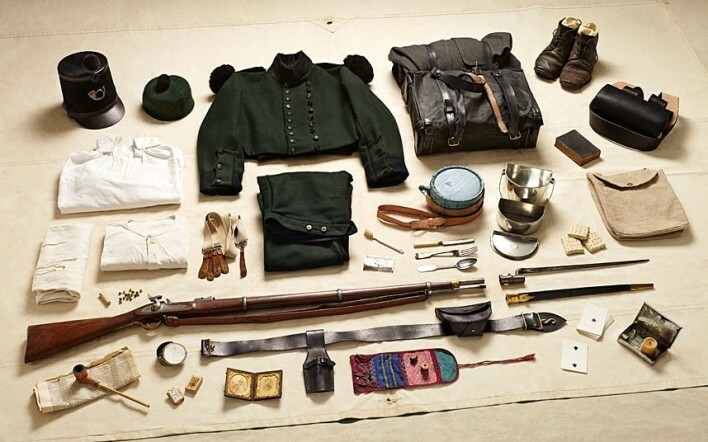 1815 private soldier, Battle of Waterloo Kit issued to soldiers fighting in the Battle of Waterloo included a pewter tankard and a draughts set. 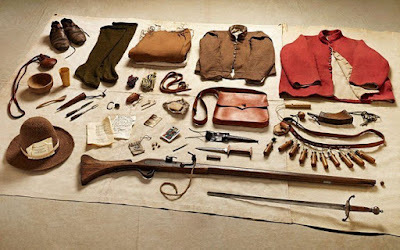 1854 private soldier, Rifle Brigade, Battle of Alma Each picture depicts the bandages, bayonets and bullets of survival, and the hooks on which humanity hangs: letter paper, prayer books and Bibles. 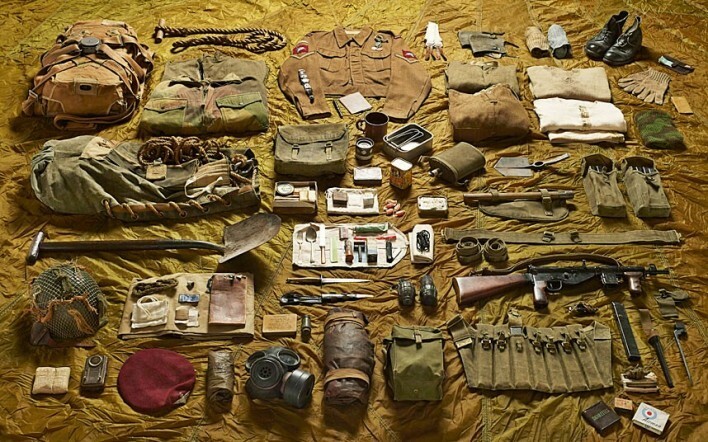 1916 private soldier, Battle of the Somme While the First World War was the first modern war, as the Somme kit illustrates, it was also primitive. 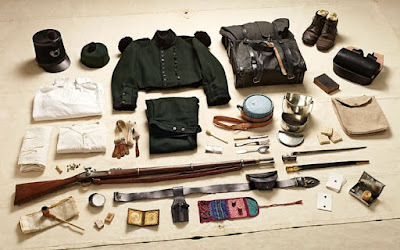 Along with his gas mask a private would be issued with a spiked ‘trench club’ – almost identical to medieval weapons. 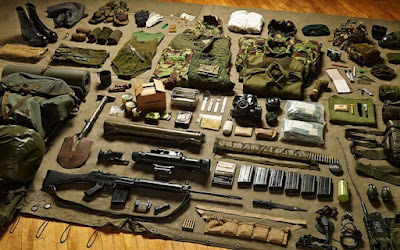 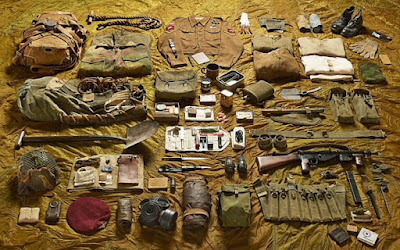 1944 lance corporal, Parachute Brigade, Battle of Arnhem Each photograph shows a soldier’s world condensed into a pared-down manifest of defences, provisions and distractions. 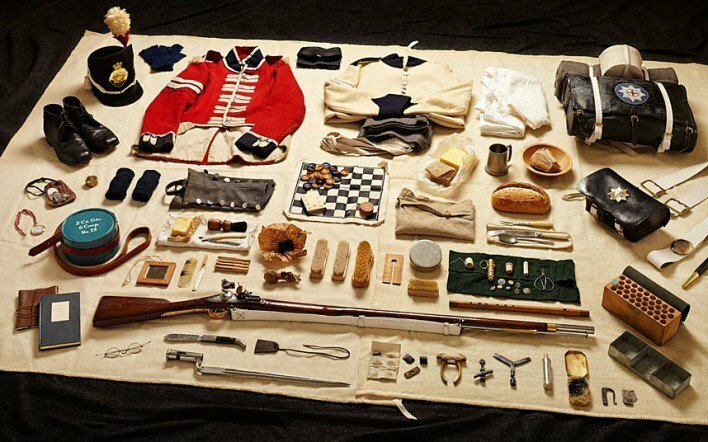 There is the formal (as issued by the quartermaster and armourer) and the personal (timepieces, crucifixes, combs and shaving brushes). 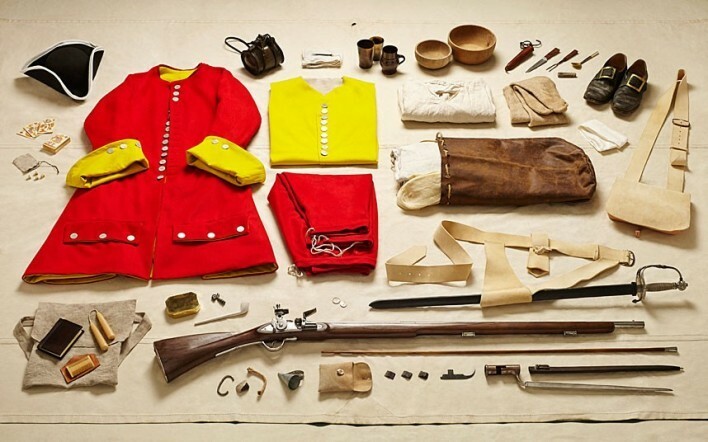 1982 Royal Marine Commando, Falklands conflict From the cumbersome armour worn by a Yorkist man-at-arms in 1485 to the packs yomped into Port Stanley on the backs of Royal Marines five centuries later, the literal burden of a soldier’s endeavour is on view. 2014 close-support sapper, Royal Engineers, Helmland Province The evolution of technology that emerges from the series is a process that has accelerated over the past century. 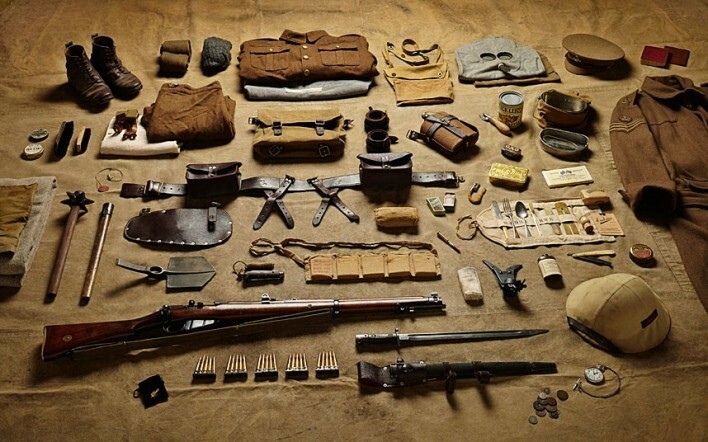 The pocket watch of 1916 is today a waterproof digital wristwatch; the bolt-action Lee-Enfield rifle has been replaced by laser-sighted light assault carbines; and lightweight camouflage Kevlar vests take the place of khaki woollen Pattern service tunics.